All right, all right, this is a very random post relating to art and butterflies. And whatnot. Because here at VitaminSea, we are all about whatnot. Life is too short not to include it in our focused daily endeavors. I have a question for you all, and it pertains in part, to butterflies. This is bugging me, people. I have raised my kids and I have failed them. Either that, or they were switched at birth. It is Sunday, the 18th of May. We are all gathered together as a family unit at the Gulf Coast Museum of Art, where one of Brittany's photos is on exhibit. 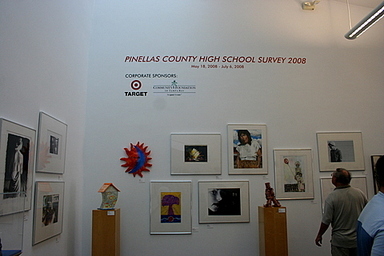 County-wide public and private school art teachers were invited to submit their student's best works of art. The pieces were then judged by an independent artist/art educator who decided which works would be included in the exhibition. (OH! I am so proud. How can I not be??! I'll show you a copy of the photo as soon as I can.) The works of art by these students is stunning, and in some cases, thought provoking as well. The museum sits on the grounds of one of the most beautiful botanical gardens on the west coast of Florida. You should go there if you ever have a chance to see our area. Admission is free. In any event, an odd thing happened after the ceremony. Neither my hub nor my two garden-illiterate daughters wanted to tour the grounds. I found that highly amazing. It is one of my favorite places 'round these parts. Richard actually wanted to go home. Samantha said she and her boyfriend were going back to his house to help him move into a smaller bedroom at his house because his mom wants his room for an exercise room. HA! I cackled, she's phasing him out. Moms, you know this is true, right? Oh, for certain, although he disagreed and Samantha laughed. Ok, so they were excused, but as they left, they walked right past a BEAUTIFUL rose garden and several outdoor art sculptures without even LOOKING at them. Samantha, I had always thought, was my creative/artsy one. Brittany, perhaps noticing the gigantic albatross hanging in the air that belonged to my Canon Rebel, which was glaring at her from it's viewfinder (it has a mind of it's own and it expected to be used), half- heartedly said she'd like to see if there was a gator on the premises. I said I knew where there was one. I'd seen it earlier in the week, and also the week before, at the retention pond behind the butterfly garden. So we walked across the grounds, around the palms and fountains and through the stone walkways and finally, entered the wooden path that was the butterfly garden. Butterflies, were everywhere. Rick and Brittany walked right through it in single file, looking straight ahead. Britt was text messaging. Rick was talking to someone, I'm not sure who. Butterflies, to the left and right of them, went unnoticed. I began to wonder, is it just me? Am I the only one to notice these things, especially in my own family? I guess I figured they'd just pick up on this interest of mine as time went on, but I guess not. Sometimes in the parenting process, your kids don't always absorb what you've exposed them to by rote observation. Or maybe they were just tired and hungry. We did go out to eat afterward for that reason. Would you notice something like that in a garden, or are you impressed by something like that? It wasn't so long ago that almost anywhere you went in Florida, they didn't have butterfly gardens. It just wasn't that common. To walk into a wild one and see so many of them at once, in one place, is fascinating. The young gator sensed them coming and decided to hide. He's a little 4 footer. you're wasting 5/7th of your life.